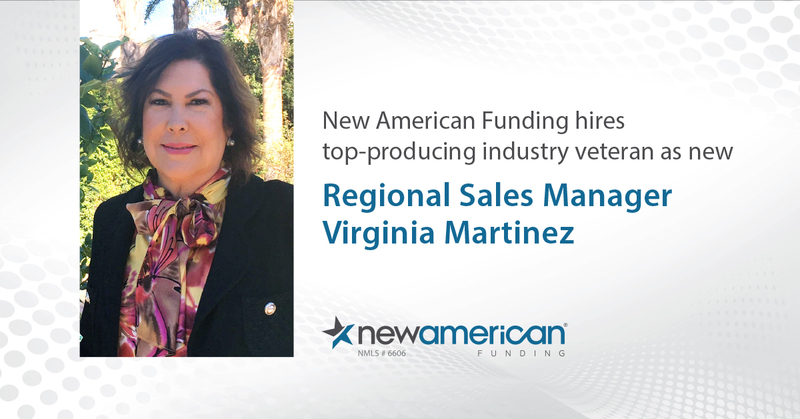 TUSTIN, CA, November 7, 2017 – New American Funding, a leader in the mortgage industry, has named Virginia Martinez as Regional Sales Manager to cover its Southern California market from the Central Coast to Coachella Valley. Martinez will oversee the daily operations of the region while simultaneously working to expand the territory with the opening of new branches. Martinez brings with her 25 years of mortgage banking experience, where most recently, she worked as a highly accomplished regional executive who lead a top-producing territory at her company. Martinez, who has successfully recruited, trained, and mentored some of the industry’s best mortgage originators and managers, will also work to increase the company’s growing team of originators. Martinez is active with the National Association of Hispanic Real Estate Professionals and the Builder Industry Association of Southern California.